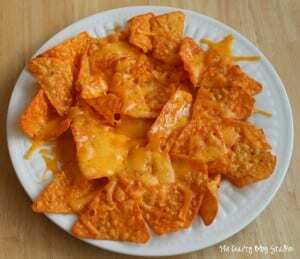 Fast and Easy Microwave Nachos using favorites like Doritos and Wholly Guacamole. A great late night snack! This is my very favorite Sunday after church snack. At to be honest I have it most Sundays. The best part of these Nachos is they really are fast and easy. I don’t use an exact recipe but more just throw the ingredients together. Start with Doritos. 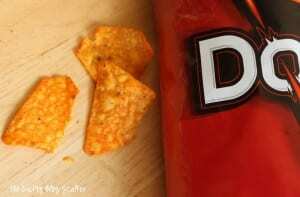 MMMM I love Doritos. Put a couple handfuls of Doritos on a microwave safe plate. 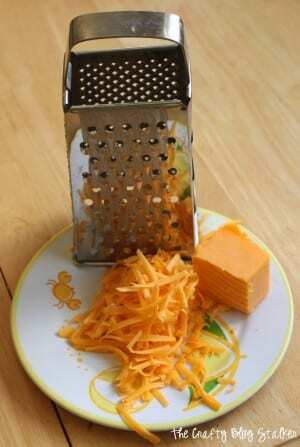 Grate some cheese. My favorite is sharp cheddar, but I usually use just whatever we have on hand. 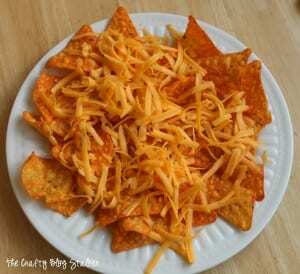 Sprinkle the shredded cheese over the plate of Doritos. Put in the microwave for about the 30 seconds. This time, can be more or less depending on how big your plate or much cheese you use. Now these nachos are really good just like this. But the next 2 ingredients make them really tasty! 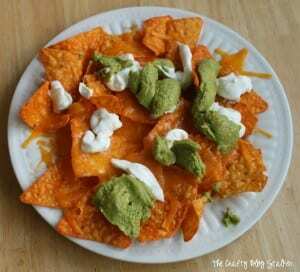 Spread some Sour Cream and Guacamole over the nachos. Oh My these are YUMMY! What’s your go-to weekend snack? My hubs LOVE doritos! We make all the fixings for burritos, beans, shredded chicken, etc. and then dump them onto a big plate of doritos. YUM! Ohh these look so good! Nachos are one of my weaknesses and I’m sure I’d polish off a whole plate of these very quickly lol!! They look delicious! I love doritos and I love nachos. This looks awesome! Genius idea!! 🙂 I love me some nachos and I am totally going to have to make them this way! Thanks for linking up to Thrifty Thursday! Thanks for sharing at the Thursday SWEET HAUTE Share Linky Party at the SWEET HAUTE Blog! 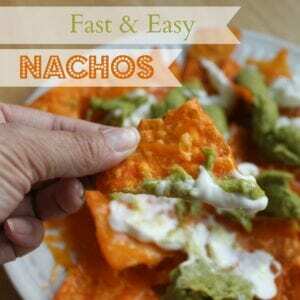 We love nachos, easy to put together and tasty…!!!! Oh my word, these look delicious, and so easy too! Love snacks like that! 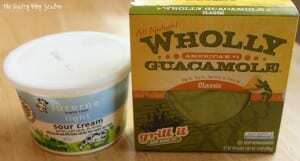 I didn’t used to like guacamole, but lately, I can’t get enough of it. lol Definitely will be trying these in the near future. :) Thanks for sharing on Inspire Me Wednesday. Pinning! Guess what??? ?, your post received the most hits so CONGRATS you’ve been featured for this post!!! Thanks for sharing….appreciate it. What better than simple and yummy! Sounds good. I never would have thought of Dorritos!